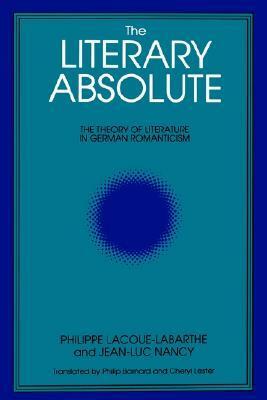 The Literary Absolute is the first authoritative study of the emergence of the modern concept of literature in German romanticism. The authors trace this concept from the philosophical crisis bequeathed by Kant to his successors, to its development by the central figures of the Athenaeum group: the Schlegel brothers, Schelling, and Novalis.This study situates the Jena romaThe Literary Absolute is the first authoritative study of the emergence of the modern concept of literature in German romanticism. The authors trace this concept from the philosophical crisis bequeathed by Kant to his successors, to its development by the central figures of the Athenaeum group: the Schlegel brothers, Schelling, and Novalis.This study situates the Jena romantics' "fragmentary" model of literature--a model of literature as the production of its own theory--in relation to the development of a post-Kantian conception of philosophy as the total and reflective auto-production of the thinking subject. Analyzing key texts of the period, the authors articulate the characteristics of romantic thought and at the same time show historical and systematic connections with modern literary theory. Thus, The Literary Absolute renews contemporary scholarship, showing the romantic origins of some of the leading issues in current critical theory.